That I don’t want to get scared into not thinking for myself. I weigh everything. Even what you just asked me, I would have to really think about it and know the facts in each of those situations before I made a judgment. Because I love Bill Cosby, and I love what he’s done for the world. But if he’s sick, why would I be angry with him? The people who got hurt, I feel so bad for them. I want them to feel better, too. But sick people do evil things; hurt people hurt people. I know I could be crucified for saying that, because I’m supposed to be on the purple team or the green team. I’m not trying to rebel against what everybody’s saying, but maybe I want to measure it. Somebody will call me and ask me to come to a march because such and such got shot. In that situation I want to know what really happened. I’m not going to jump up and go march just because I’m green and the person who got shot is green. The rush to get mad doesn’t make sense to me. That’s not something most of us are good at. Yeah, I did. Hitler was a wonderful painter. No, he wasn’t! And even if he was, what would his skill as a painter have to do with any “good” in him? Okay, he was a terrible painter. Poor thing. He had a terrible childhood. That means that when I’m looking at my daughter, I could imagine her being in someone else’s home and being treated so poorly, and what that could spawn. I see things like that. I guess it’s just the Pisces in me. I’m perfectly willing to accept that you might be operating on a higher moral plane than I am, but I think going down the route of “Hitler was a child once too” is maybe turning the idea of empathy into an empty abstraction. Maybe so. It doesn’t test my limits—I can see this clearly. I don’t care if the whole group says something, I’m going to be honest. I know I don’t have the most popular opinion sometimes. Perhaps not! 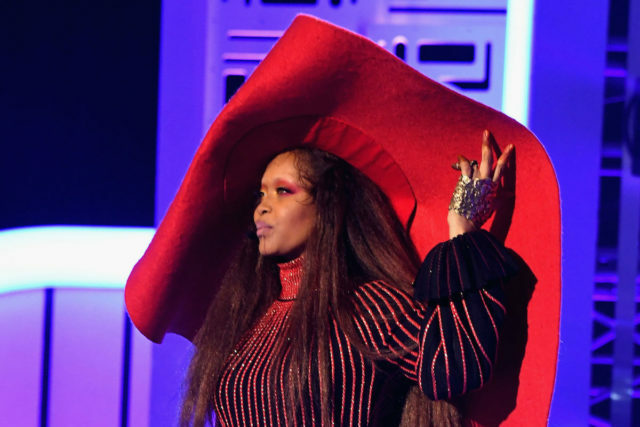 Elsewhere in the interview, Badu revealed her admiration for Star Wars: The Phantom Menace’s Qui-Gon Jinn vs. Darth Maul battle, discussed how she handles popular perceptions of herself as “some mystical creature that controls people’s minds,” and said her next project might not require much in the way of traditional songwriting: “I’m thinking about music, but it’s all about tuning forks, singing bowls, bells, drums. … That’s what I’m interested in right now—sound vibration. If I put out another project, it’ll be like that.” The entire strange Vulture interview is worth reading; do that here.